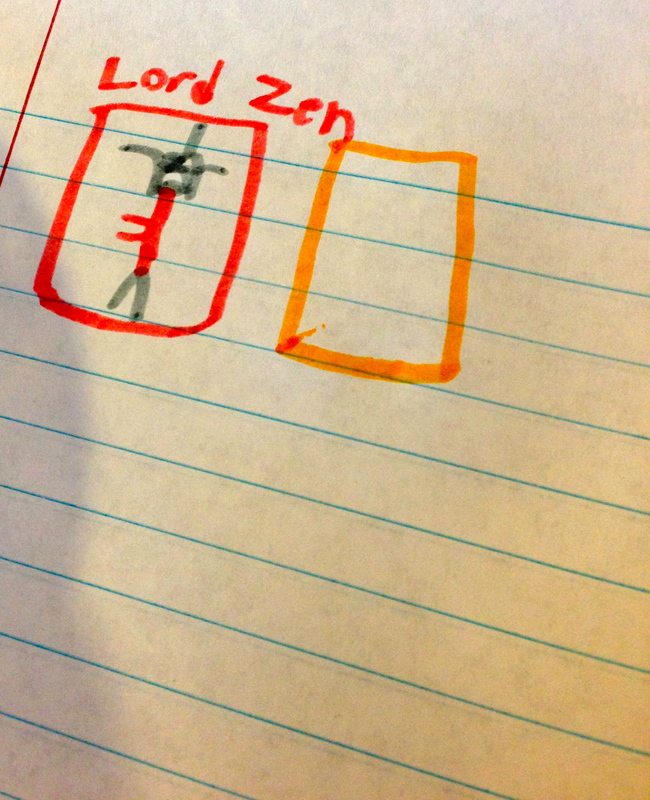 Luke has invented a new comic book character named Lord Zen. I find this encouraging. I am not, by nature, the most positive of people. I try not to be cynical, but I am never surprised when someone disappoints me. This tendency towards negativism is one of the reasons I started this blog. I was trying to find myself a better attitude. Aided by the wisdom of Eckhart Tolle (among others), I’m working towards becoming a more complete version of my best self, even though it’s not an easy journey. Just about the time I feel I am coming closer to reaching a better place, some new challenge presents itself and I’m back in Eeyore mode again. Luke’s recent diagnosis of dyslexia is the latest in a recent string of course corrections my life has taken. I’ve been trying my hardest at every turn to put a positive spin on the things I never asked for but got anyway. Today, I went to a Lunch and Learn lecture with Luke’s new tutor. A local pediatrician was speaking about diet, exercise, and health, especially with regard to raising children, and Marcy invited me to join her. Given our boys’ difficulties, I figured that at the very least I would have an opportunity to learn something new by attending. And I had to eat anyway, right? Sitting there with other parents and individuals concerned about their health and eating habits, it hit me that two weeks ago I hadn’t even met the woman who was my host at this luncheon. It’s incredible how quickly changes come at you sometimes and how fast a new discovery will broaden your horizons if you let it. The experience I had today was just a small part of what will be a new adventure in my life. If we have to change schools or move, the adventure will alter the landscape of my life even further. Today I determined that life is simply a giant game of dodgeball. I have two options: 1) go on the defensive and duck, weave, dive, and avoid or 2) go on the offensive and catch the ball. Attempting to avoid what’s being thrown at me seems a bit defeatist. So, I’m going to catch the ball and get in the game. Who knows what I might learn about myself along the way? Like, like, like….Your family is well on its way-you have already have mastered the challenge. Thanks for the vote of confidence, Bonnie! I wish I could say I did unfailingly well at maintaining that attitude. Working on it but definitely not there yet.